Winter carnivals, fly-fishing film festivals, skijoring parties and more: it’s all happening in the mountains near Calgary in February 2019. 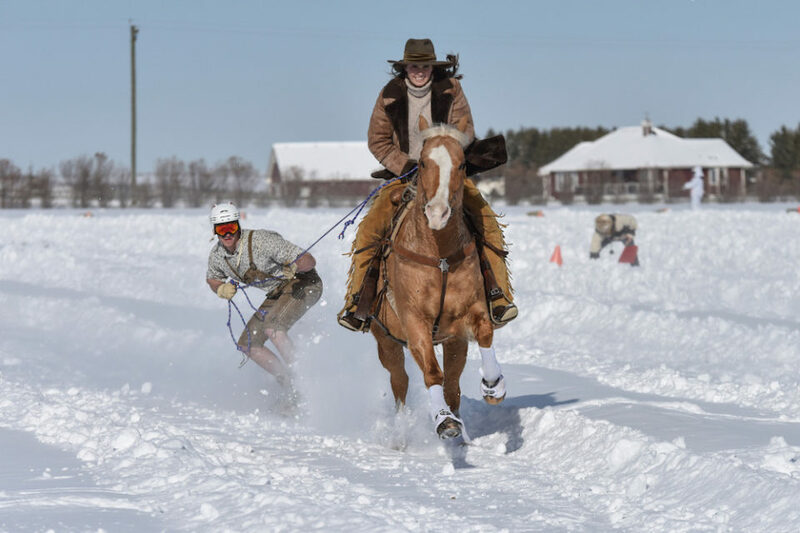 Catch Skijordue on Saturday, Feb. 16 at the Calgary Polo Club, an event that combines skijoring (a sport where skiers and snowboarders are towed behind horses) and fondue. Photo by Chad Rowbotham. The Cave and Basin National Historic Site in Banff is paying tribute to the 1920s-era Banff Winter Carnival this season with a program of outdoor winter games and activities offered Wednesdays through Sundays until March 31. In addition to the outdoor stuff you can also check out vintage films of the original carnival. General admission to the Cave and Basin applies. The Masters Cup Beer League Racing Series at Mt. Norquay ski resort is a chance for former ski racers to get back in the gates for a little GS action. (Wannabe racers are also welcome as no prior race experience is required to take part.) The 2019 night-racing series kicked off in January and continues Feb. 1, 8 and 22 and March 1. Racing starts at 6:45 p.m. and the drop-in registration fee is $20 (lift ticket not included). Racers are guaranteed a minimum of two timed runs and can enjoy food-and-bevvy specials during the post-race awards at the resort’s Lone Pine Pub. If you really love beer, then a road trip down the Icefields Parkway to the Jasper Beer & Barley Summit may be in order. This Alberta Beer Festivals event runs Feb. 1 and 2 at the Fairmont Jasper Park Lodge. If you don’t want to stay at the JPL, you can get a nightly “festival only” ticket for $74.99 which includes beer and spirit samples and food prepared by the Lodge’s culinary team, as well as shuttle service to and from the JPL from downtown Jasper. Biathlon is a pretty impressive sport, combining the cardio of Nordic skiing with the calm of target shooting. You can watch the best biathletes in the world do their thing Feb. 7 to 10 at the BMW IBU World Cup Biathlon at the Canmore Nordic Centre. Check out the mass-start race on Sunday, Feb. 10, where 30 athletes set out at the same time and make their way through four shooting ranges, with 150-metre penalty loops for each missed target. The annual Canmore Winter Carnival, which runs this year from Feb. 1 to 10, includes an event on Saturday, Feb. 9 called Ice, Logs N BeaverTails with ice-carvers doing their best take on the theme of “constellations,” as well as competitions for log-sawing and BeaverTails-eating. The festivities take place from 9 a.m. to 5 p.m. at the Canmore Civic Centre Plaza. The culinary team at Kicking Horse Mountain Resort’s Eagle’s Eye Restaurant is teaming up with Kelowna B.C.-based Mission Hill Winery for a multi-course dinner paired with Legacy Collection wines on the evening of Friday, Feb. 15. Dinner tickets are $125 each, and can be reserved through the resort’s central booking at 1-866-754-5425. If your ski or snowboard gear is a couple years old and you want to test-drive the latest and greatest models, Lake Louise Ski Resort is hosting a free demo day on Saturday, Feb. 16 with representatives from Burton, Nordica, Blizzard, Smith Optics and other brands. Leave a credit card or other piece of ID and you can take their gear out for a couple runs (so long as you have a valid lift pass). The City of Cranbrook is launching a new winter festival this year on Saturday, Feb. 16. The Cranbrook Winter Blitzville will have X-Games snowmobilers, a pro-snowboarder rail-jam and live music on an outdoor stage. The downtown-based festival will also have food trucks and an outdoor bar and will culminate in a big-time fireworks display. The Banff Centre for Arts and Creativity has moved its annual family arts festival to the Family Day provincial holiday this year. The 2019 Family Winter Arts Festival runs all day on Monday, Feb. 18 and features free programming as well as ticketed main-stage performances by comedian/magician Wes Barker at 1 p.m. and musician Norman Foote at 4 p.m. Foote will also do three free songwriting workshops throughout the day. Other free events include screenings of family-friendly mountain films and drop-in drawing workshops for kids and teens — most of the free events still require registration, which can be done online at banffcentre.ca/family-winter-arts-festival. Along with the arts events, the Banff Centre’s pool has free family swimming from 1 to 5 p.m. If you want to stay on campus, the Banff Centre hotel is offering double-occupancy rooms at $199 per night for the Family Day weekend. The International Fly Fishing Film Festival (IF4) returns to Fernie on Thursday, Feb. 28 with screenings of professionally produced short and feature-length films about fly-fishing from all over the world. The festival is presented by Elk River Guiding Company at The Vogue Theatre in downtown Fernie. Doors are at 6:30 p.m. with films at 7 p.m. Tickets are $15 and can be purchased in advance online or at the door. Vogue Theatre, 321 2 Ave., Fernie, B.C.